It’s a week since we arrived in Montreal. The weather is really hot. Good for the people of Montreal, after the long winter. People sun tanning in their balconies, in the parks, children playing under the water fountains, pet owners out with their pets, cold beers, barbecues even in the smallest balconies, alfresco dining, beautiful flowers, greenery, street festivals, people riding on their bikes, walking, hiking, an endless list of ice cream flavours. The whole city is bustling with activities. For me its just too hot (I get too much sun anyway in Mombasa). So I really don’t want to get out of the house till after 4pm when the heat is a bit bearable. However, sometimes we have to get out when the sun is beating on our heads. I then walk around with ice cold water. Talking about heat, couldn’t believe that the chocolate was melting so fast in my hands when I was preparing the chocolate medallions. Our 46th theme#FoodieMonday#Bloghop is Dry Fruits. Dry fruits or dried fruits are fruits that are dried either in the sun, dryers, dehydrators or ovens whereby the original content of water is removed. Fruits are dried and consumed when not in season by adding them to breads, salads, rice, cakes, stews, curries, desserts etc. Dried fruits add natural sweetness to a dish. During the early civilization fruits were picked and dried to consume during the winter or cold seasons.They also used them as natural sweeteners. Nowadays usage of dried fruits is wide spread, where most people use it everyday. Most nutritionists recommend a handful of dried fruits to ward off hunger pangs. Its better to reach out for some dried fruits than a packet of fried snacks. However, like everything else, too much is not good as they are sweet. I prefer to nibble on a few raisins, a couple of figs, dates or apricots to satisfy my sweet tooth. When the group decided on dry fruits, I was thinking of cakes, muffins, bread. Both father and son didn’t want to have any sweet bakes. But then hubby is always looking for chocolate after dinner. 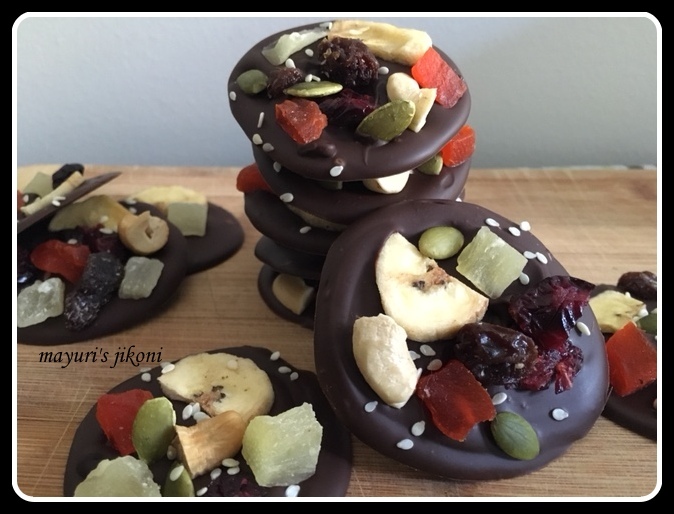 So I decided to make chocolate medallions with dried fruits, nuts and seeds. One medallion is enough to beat the craving and is healthy. Melt chocolate either over boiling water or in the microwave oven. To melt chocolate over boiling water,put chocolate chips in a small heatproof bowl. Boil water in a saucepan. Place the bowl in the pan, it should not touch the water. So make sure it sits at the rim of the pan.Mix the chocolate with a spoon. The steam from the hot water will melt the chocolate. To melt it in the microwave oven, put the chocolate chips in a microwavable container. Heat for 1 minute. Remove the container from the microwave oven and mix the chocolate chips. Return the container into the microwave oven and heat further for 30 seconds. Mix well. Put a tablespoon of the melted chocolate on one of the traced circle. Spread it out a bit. Repeat till the melted chocolate is over. I put each fruit, nut and a sprinkle of seeds on each medallion so that each piece has an equal amount of fruit, nut and seeds. Put the medallions with the tray or board in the fridge till the chocolate sets. Remove the medallions from the paper and store in a container in the fridge till required. Believe me, cold chocolate medallions taste so much better than the room temperature ones. I haven’t give the measurements of the dried fruits, nuts and seeds as the amount required depends on the type of fruits, nuts and seeds you use. You can add any fruits, nuts and seeds of your choice. Use only dark chocolate if you prefer. Use white chocolate instead of dark and milk chocolate. The number of medallions you get will depend on the diameter of the circle. I got 16. Minimal ingredients yet tempting medallions' recipe share Di! So true Pushpita and hardly took any time. Thanks Suajata. The charming thing about this recipe is that one can choose what type of chocolate, fruits, nuts and seeds one wants to use. Wow.. these look gorgeous.. definitely a kids delight ! Thanks Shobha, its even a good treat for adults. The medallions look so tempting. I am sure my kids will love it.Bookmarking it.Thanks for recipe.